The name, ownership, and location of Gray’s IDA Drug Store may have changed over the past 60 years, but there was one constant over the past 60 years — until last Thursday. 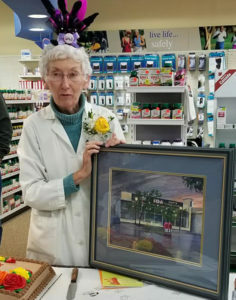 Two days shy of her 80th birthday, Judy Dowling worked her last shift behind the pharmacy counter and started her retirement. She recalled an emergency pushed her into duty years ago. Dowling started as a counter clerk at the store, which was then on the north side of Dundas Street. She continued on, taking over the job of organizing cases for Christmas and specialty holidays and eventually the store’s large window displays. Eventually, there was an opportunity for re-education as a pharmacy technician. She signed up and passed the course. Dowling said she’s seen her job change dramatically over the years as technology has improved. Her most favourite aspect of her job stayed fairly consistent, however. She loved helping people and she expects she’ll miss the day-to-day interaction with her customers during her retirement. 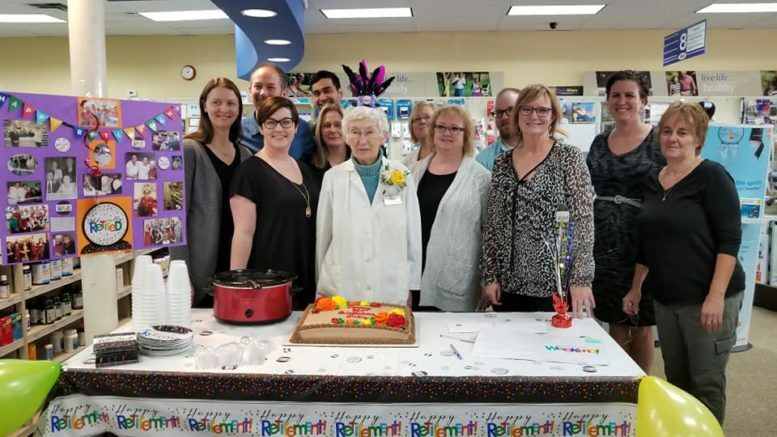 On Thursday, as co-workers put party decorations up around the store and Dowling was presented a congratulatory cake, she said most visitors were asking her what she is planning in the years ahead. Dowling said she really hasn’t had time to think of it. For her 80th birthday, Saturday, she planned to work the fall bazaar at St. Patrick’s Roman Catholic Church, where remains an active parishioner. She also said she plans to visit people in the hospital or in their homes. The pharmacy has been in Hager’s family for over three decades when his grandfather bought it from Lyn Gray and moved it into the present location in the former Canadian Tire building. Over the years, he grew accustomed to Dowling working there. Hager described Dowling as a hard worker — he said she barely paused even on her last day because she had some tasks to finish — and a creature of habit who knew what worked for her and was reluctant to change. She was also determined to get to he 60-year date, even as she battled illness in recent years. The familiarity became an asset for Gray’s IDA. “It was great for business,” said Hager, who said new and returning customers enjoyed seeing a familiar face. He noted some grandchildren have stayed local to the store because their grandparents knew Judy, some of them going back to when she was in school and others remembering her many contributions to Selby Village Theatre. It’s a happy story Hager isn’t certain he’ll see again. He said Dowling will always be welcomed to visit and to associate with the store and its staff.